Greetings, and welcome to this autumn 2014 edition of the Co-operative Housing International’s e-Bulletin. In this edition we are focusing strongly on sustainable forestry practices, the subject of a resolution proposed to the Alliance’s General Assembly in 2011 and subsequently adopted. Housing co-operatives engage in construction and therefore look to ways in which they can make their construction practices more sustainable. Using wood products that come from sustainable forestry practices is one very important way to adopt responsible construction methods. In this bulletin you’ll find a wealth of information on new developments in the sustainable use of forest products and some good practices from different countries. And we will return to the original General Assembly resolution, and show you how you can adapt it for adoption by your co-operative housing organization. I wish to commend our sectoral organization Co-operative Housing International (CHI) for its commitment toward sustainability. Back in 2011 CHI submitted a resolution to the General Assembly in Cancun promoting the use of certified timber. As you may remember the resolution was widely supported by the delegates. This commitment aligns with our ambitious plan laid out in the Blueprint for a Co-operative Decade. The Blueprint calls on each of us as co-operators to become an “acknowledged leader in economic, social and environmental sustainability”. One of the goals set in the Blueprint is to “position co-operatives as builders of sustainability”. CHI is calling on all of you to endorse the sustainability resolution and adopt procurement policies that commit your organization to use certified timber and other forestry products in your business operations. Let’s not delay. Let’s join together in the promotion of the Sustainable Forestry Initiative by endorsing the Sustainability Resolution and adopting a procurement policy for your organization. At the General Assembly of the International Co-operative Alliance in Cancun, Mexico, in November 2011, ICA Housing passed a resolution that asked all ICA member co-operatives to make a commitment to support and promote within their own organizations, the use of sustainable timber and other forest products certified as such by reputable organisations like the Forest Stewardship Council or PEFC International (the Programme for the Endorsement of Forest Certification) and to adopt procurement policies and practices that honour the principle of sustainability in forestry management. This e-Bulletin revisits the resolution that was adopted in 2011 and reports on some advancements in sustainable forest management, and certified sustainable wood products and explores how those products are being used in housing construction and specifically co-operative housing development and capital repairs. This is in follow up to the work we have already done. The Forest Products Annual Market Review 2013 reports that the development of new refinement processes has led to the production of new and more affordable wood based products such as cross-laminated timber (CLT). The report states that cross-laminated wood panelling is being used more widely in the construction of wood buildings and multi-storey timber buildings due to its high strength-to-weight ratio. The product is designer-friendly, easily assembled and is extremely strong (e.g. earthquake resilient). This is just one of many products under development and being used in the construction and housing market. Wood pellets are manufactured from compressed wood fibres and other forest residues such at sawmill and logging residues, tree tops and branches and low grade logs. They can be used as a coal substitute for power generation and also for heating, cooling and hot water in residential and commercial buildings. This report focuses on the experiences and practical application of timber and other forest products from sustainable sources in the construction of residential buildings In Germany and specifically in the German co-operative housing market. The Bauverein Halle & Leuna eG housing-cooperative in Halle, Saale with nearly 8000 flats and more than 17,000 occupants, is focused on the principle of sustainability. We determine that a housing co-operative is sustainable if it is following its economic objectives and meets social responsibility standards. Unfortunately, up to now we have no experience in the use of timber and other forest products from sustainable sources in construction, refurbishment or extension of residential buildings. In 2014 we discussed the interesting and new possibility of a building extension module which is made of wood from sustainable sources. We are also looking at an application for pre-fabricated houses (slabs), to improve housing accessibility for disabled or elderly people in these buildings (TESEnergyfacade – see below). The municipal housing company of Munich, Bavaria (GWG München) created a very impressive report on the use of timber in the housing construction and produced an impressive ecological balance sheet. As an example, the annual German timber-harvest of 70 Million cubic metres could provide 45 Million cubic metres of wood construction for residential buildings. Just one third of this theoretical amount would be enough to erect the whole yearly German residential housing construction volume. 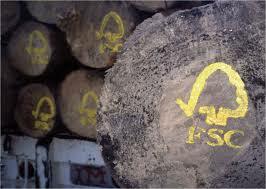 An additional ecological benefit is the capture of carbon dioxide in the timber. One cubic metre will capture one ton of carbon dioxide for the lifetime of its use in buildings – this means at least 80 – 100 years. Due to the increasing prices for construction steel, copper and a lot of metals, non-renewable resources will lose their importance in the construction sector. Timber however is renewable and re-growing. There are two impressive examples for the use of sustainable wood products in the housing construction market in Germany. One is the project planning company named ReBuild Generalplanung GmbH, which planned the construction of a residential building extension owned by the municipal housing company in Augsburg, Bavaria. With the so called Projekt Grüntenstraße (winner of the German award for the refurbishment of residential buildings in 2013) ReBuild created a demonstration model of the European joint project smartTES and E2ReBuild. TES-EnergyFacade is an international research project, which aims at developing a method for the energy-efficient renovation of the building envelope, based on woodframed prefabricated facade elements for the improvement and modernization of facades (under the leadership of the TU München (Technical University of Munich, Bavaria, Professor Stefan Winter and Professor Hermann Kaufmann). The other example is the municipal housing company GWG in Munich, Bavaria [pictured right], which also used the E2ReBuild incentive programme for the refurbishment and extension of an existing residential building in Munich, Badgasteiner Straße 4, 6, 6a. The extension is a building which is four storeys high and is made of wooden prefabricated façade elements.